Aberto o ano todo! Aninhado entre as pequenas cidades ribeirinhas de Alma e Nelson, Wisconsin, The Great River Retreat Guest House fica nas marés do Mississippi. O que antes era uma cabana dia sem água corrente ou eletricidade para falar, foi completamente remodelado em 2013. Cada detalhe foi considerado, desde os pisos de madeira raspada mão, o teto de pinho serrada em bruto Amish, o contador de mármore de pedra natural topos, a lousa verdadeira pedra em torno do fogão a lenha free-standing (lá para mantê-lo confortável em uma noite fria), para o convés rastreados em com vistas deslumbrantes sobre as águas represadas Mississippi calmas e os trens que passam perto. Você vai sentir como se acaba de escapar para o paraíso. Se este lugar parece um pouco para verificar rigorosamente VRBO Listagem: 821489 como esta é a Casa Principal adjacente à propriedade que também está disponível para aluguel. Shows chuveiro. Pequeno roupa mais próximo. Toalhas de banho. Por favor, traga o seu próprio shampoo, condicionador, lavagem do corpo, etc. My 4 college girlfriends and I stayed here for a Girls Weekend away and it was awesome. Super clean, updated and organized (and we have some gals with fairly high standards in our group ;-). Beautiful property in a cute little town. We're already talking about coming back next summer. Thanks Jessica and Jeremiah! This is a great place to get away for a while. The cabin is very modern with all the amenities like cable and a flat screen TV. It is well amaintained and very clean. The highlight is the large screened in porch that provides a sheltered, bug free opportunity to enjoy the river and the trains. The only caution is that it is very close the the BNSF mainline to Chicago. There are usually a couple of trains an hour and they are loud. But the noise only lasts a minute or two and then the quiet of the river returns. The town of Alma is close with a few places to eat and get limited supplies. Wabasha, MN is a bit farther with better supply options. Screened in porch is awesome. Great place. Clean and ready early! Wonderful property! We had a great time. Very upscale and super clean. My son, my father, and I had a great mid-week getaway here in mid-June. The place was as cozy as advertised. We're big train buffs so being trackside was a plus. Wouldn't mind coming back again some time. My wife and I stayed here for a couple nights in early October and had a great time (Very Peaceful) ! 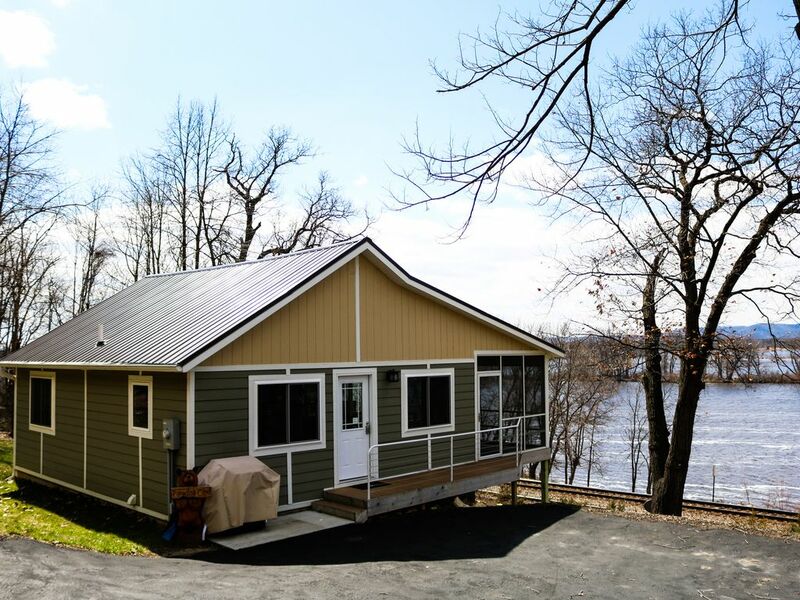 The cabin has everything you would need and the location is terrific... easy drives to Wabasha and/or Lake City. Clean, modern, comfortable and great views of the Mississippi! We fished a lot and caught bass, yellow perch and sunnies. The kids enjoyed counting the rail cars and the porch is a great place to relax. *Prices shown do not reflect the 6.5% tax.